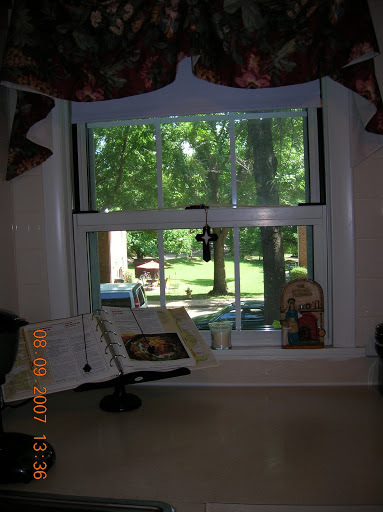 Here’s my kitchen counter just to the right of the sink. My KM is on the window sill. It’s a dark picture, especially small. If you click on it, it looks better. Here’s a closer look at my dinged (from multiple moves) and (eek) dirty KM. I just love the image of the Child Jesus asking his mother for some bread. 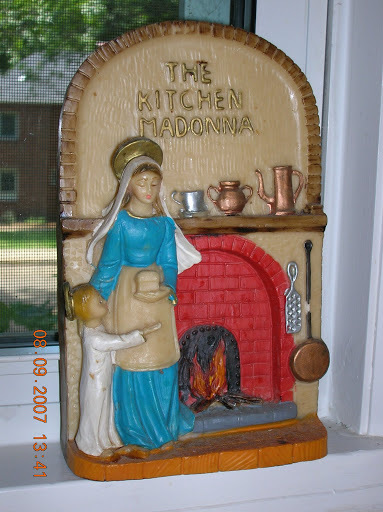 If you have a Kitchen Madonna to post, let Matilda know. And me too! ← How could I have forgotten that? Thank you! I love the colors and I see no dirt! That’s really pretty! You sure wasted no time in turning your new home into a “home.” May your family be blessed with happiness and health during your time there. That is very sweet! Thank you! Waht a wonder Madonna! I’m with Missy, I’d love to have one or two especially as gifts to families moving into a new home.